Dendrites of first order neurons travel in spinal nerves and cell bodies are found in dorsal root ganglia. 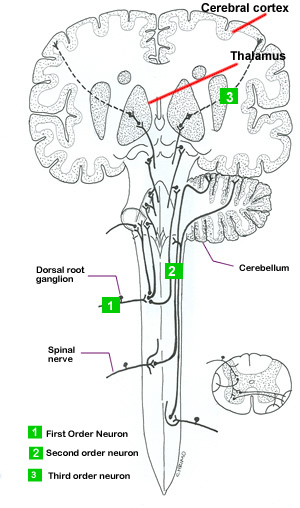 Axons from ganglia pass through the dorsolateral tract and bifurcate on entering the dorsal white column of the spinal cord. The ascending and descending branches give off collaterals to the gray mater. Both ascending and descending fibres synapse with tract neurons in Laminae 1,5,6 and 7. Second order tract neurons decussate, and ascend in the ventral spinothalamic tract. Some fibres remain ipsilateral. This tract synapses in nucleus ventralis posterior of the thalamus. Third order neurons traverse internal capsule, corona radiata to the somatosensory cortex. Traditionally, in humans, it has been customary to recognize a lateral spinothalamic tract containing fibres conveying pain and temperature information, and a more medial ventral spinothalamic tract containing fibres conveying innocuous tactile information. However, this division has no basis in experimental observation and the two are currently just referred to as the spinothalamic tract. The central processes bifurcate, one process enters the spinal tract and the other the Chief nucleus of Trigeminal. The secondary neurons arising from the trigeminal nucleus decussate and join the trigerminal thalamic tract to the thalamus. Third order neurons traverse the internal capsule, coronary radiata and terminate in the sensory cortical area.